Smallmouth in Your Soup: Do Lucky Craft Lures Catch Smallies? Splashtail I use when fish are missing a buzzbait a lot, with the SPT 90's needle trebles, the hook percent goes through the roof. I smeared them on this one in 2008. It makes a really unique vroop, vroop noise and can be worked about 5 different ways to draw out fish. 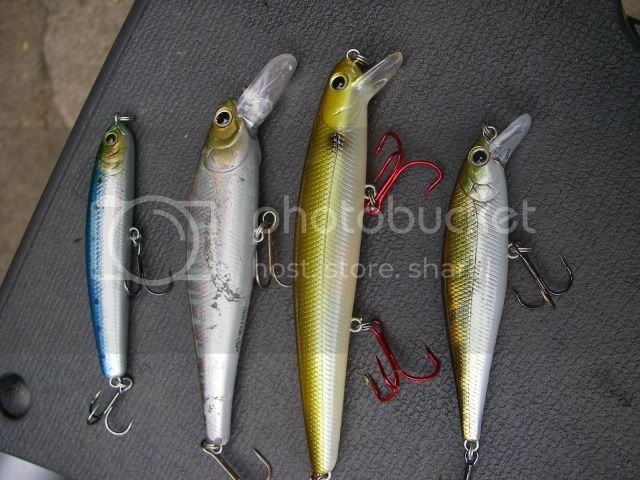 Fish it like a popper, a buzzbait, or topwater jerkbait. It simply is a must have. Gunfish 90 I use when a smaller profile Walk the Dog bait works best, it casts great and has a tight fast walk. Sammy 100 is just a killer lure for big Smallmouth Bass. 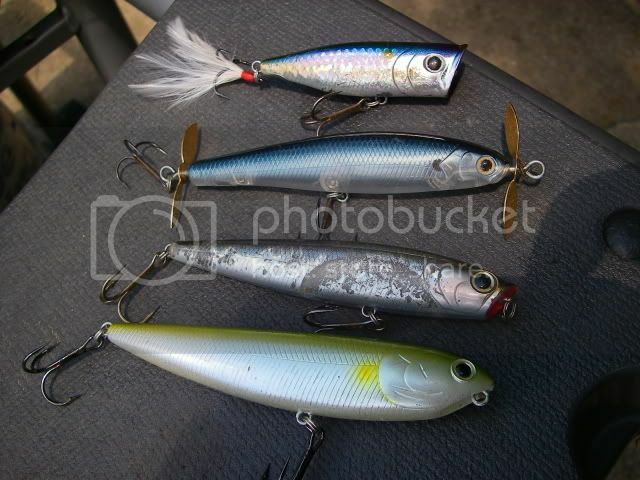 Lucky Craft Jerkbaits that I use: Left to right: Wander 80, Pointer 100, Flashminnow 115, Pointer 78S. The pointer 100 is my favorite, I've landed three 20"+ Smallies on them in limited time. IMHO superior to the Pointer 78. The Pointer 100 dives to 4-5'. I have found I can keep it from diving by jerking it hard with a high rod tip to get it to dive up or sideways, then reeling in on slack line. This prevents the lure from going deep in shallow water. The example above is the 'Misty Shad' color which I am partial to. The Wander 80 is an interesting lure that behaves like a senko/fluke. Shimmies on the drop, walks the dog on retrieve. Haven't used it as much as I should. Flashminnows and Pointer 78's I have little confidence in. Perhaps having too many go to lures at this point? Worth the money? Yes and no. find the ones that really work and stick with them, they do cast extremely well and catch above average size fish. All the topwaters are gold and have a place in a stream angler's bag. The Jerks seem to be better in the early spring around me. Using higher lbs test or braided lines will prevent losing these nice lures. It took me 200+ Smallies to lose my first Sammy 100.